You’d be wrong, because this is a real show, featuring a real host. A tattoo-obsessed, midriff-showing 90’s flashback, who, in her own right, is sort of a genius marketer. This isn’t a simple gimmick, Nadia G is the author of two cookbooks, and a deep-rooted Italian who knows her stuff, regardless of the fact that she seems like the ditzy and over-the-top girlfriend of a high-profile mob boss. And, with descriptions like “Dysfunctional Family Pizza Night” and “Wasabi Smashed Potatoes,” and talk of “deflating your meat,” how can you go wrong? Don’t take the piss, she’s cute. That’s the most unique accent on tv right now. Her producers are making her over the top for the network, but she will find her own niche. Besides, the food she’s cooking is pretty good. worst show on food network. so contrived and fake. Takes away from any cooking skills she may actually have. Like watching a “b” movie actress pretend to be a character. Not typical of Food Network stars. Worst show on the FoodNetwork. Nadia G is so cheesey and fake. So kitschy. 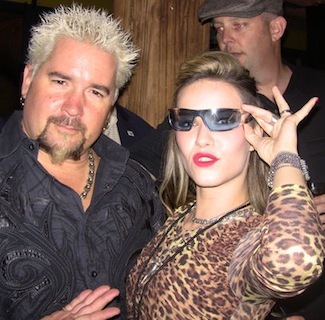 Totally not a believable character like Guy Fieri. She would do better off just being “real” more herself. Like watching a “B” movie except it’s a cooking show. My brothers friend was going to pay me with eggrolls to play with my tities. I’m now really looking forward to this show.